Reference librarians and our Staff offer help in using library resources and locating materials. If you have any questions, you can come into the library, use our chat or by telephone (ext. 5577), email (bjones@glendale.edu). Borrowing privileges: Faculty may obtain a library card by filling out an application and presenting a valid ID at the Circulation Desk. General circulating items are due at the end of each semester or intersession, but are subject to recall by other users. 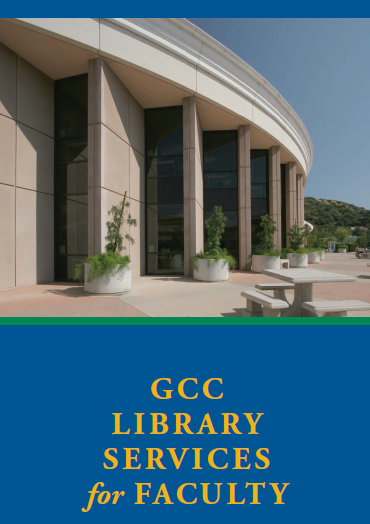 Faculty may check out reference books overnight and should make such requests at the reference desk. Using the "embed" link, you can add any Kanopy film to your Canvas. Follow the steps to embed CampusGuides into Canvas. Faculty may call the circulation desk to have a specific item held for them. If the item is available, the faculty member will be notified and it may picked up at the circulation desk. Library collection and purchasing suggestions: We encourage faculty members to make recommendations for library acquisitions. These requests can be made at the reference desk, by contacting your liaison librarian, or by filling out a Library Materials Purchase Request form online. New tenure-track faculty may request a one time grant from the New Faculty Fund. This “grant” is intended to help remedy any collection inadequacies related to your field or to courses you will be teaching. Faculty may place library or personal materials on reserve for students. To ensure that students have maximum access, we recommend that reserves check out for 2 hours and cannot leave the library. However, overnight and 3-day check out periods are also available. Please submit your request at least 1 week prior to the date needed in person or by contacting the Circulation Desk at ext. 5586.